Catch it on televisionl, it's really cool!!! 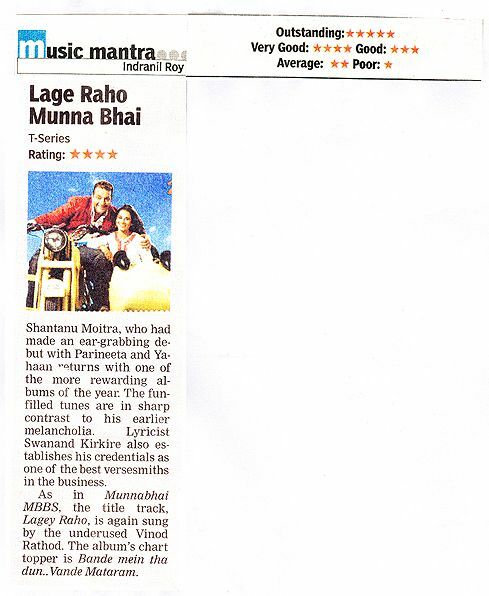 Lage Raho Munnabhai is a keeper for sure. If Shantanu Moitra’s name on the cover wasn’t already enough to get you to buy the CD, then just do it to give your system a break from the Reshammiya regime. Except for 'Pal Pal Har Pal', which is a love song, rest of the tracks are all situational but guaranteed to work well while the film is on. While a soundtrack like this may not be the best bet for turning out to be a massive commercial success, it works in an all-important area of taking the story forward. 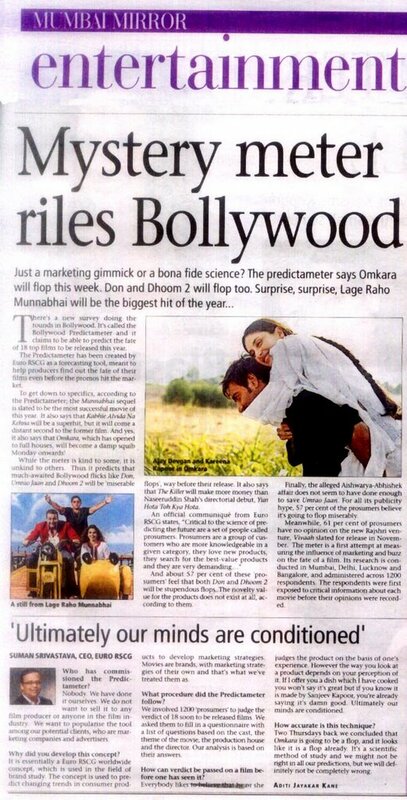 Expect the sales to show an upwards trend after the release of the film and its subsequent (expected) success! Munnabhai pays his respect to the Father of Nation Mahatma Gandhi through ‘Bande Mein Tha Dum-Vande Mataram’. Sonu Nigam leads from the front. Shreya Ghosal and Pranab support him well in this patriotic rendition. An instrumental piece of the same track follows this song. 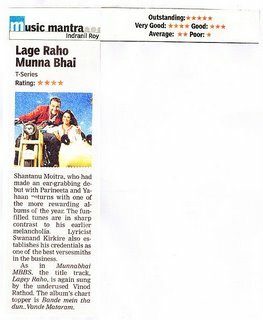 Once again Shantanu Moitra creates magic with his musical scores. These songs are sure to make deep inroads in the hearts of music lovers. Situational in nature this song may gain in popularity once the movie is out. On the whole the music is worth each and every penny you spend on it. I’d give it a four out of five on the whole. Bole to..maamu, kya soch rela hai?! Even before their release much awaited Bollywood flicks like ‘Don’, ‘Umrao Jaan’ and ‘Dhoom 2’ have been written off as miserable flops according to the Euro RSCG Bollywood Predictameter study. The study further states that ‘Munnabhai Lagey Raho’ would be a bigger hit than ‘Kabhie Alvida Na Kehna’, while ‘The Killer’ will make more bucks than Naseeruddin Shah’s directorial debut, ‘Yun Hota To Kya Hota’. According to the Euro RSCG Bollywood Predictameter; the ‘Munnabhai’ sequel is slated to be the most successful movie of the year. 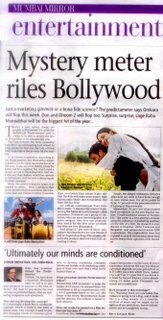 Close to 61 per cent of the prosumers indicated that Munna and Circuit (two lead characters of the movie) would earn ‘Superhit’ status for the movie. With 36 per cent of prosumers indicating that ‘Kabhie Alvida Na Kehna’ would be a superhit; it came in a distant second to ‘Munnabhai’.